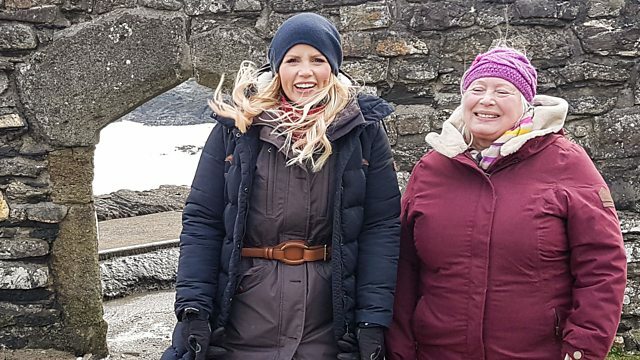 Ellie Harrison is in Pembrokeshire looking at the effect of storms on the coastline. Adam Henson is in Scotland to explore the mystery behind missing upland sheep. Browse content similar to Pembrokeshire. Check below for episodes and series from the same categories and more! This is Pembrokeshire Coast national park. It was given that status based on this, the spectacular coastline. But lately, it's been taking a battering by the storms. Look at all this sea wall that's just come down. Today is clearly no exception. has taken its toll on the coastline. we're scattered to the four winds this week. hearing how roast lamb is getting rarer. exploring the mystery behind some missing Upland sheep. and it's something that we would dearly like to get to the bottom of. the western tip of Wales. and the sea pretty much everywhere else. On a sunny day, a coastal stroll is a delight. But when the winter bites, it's a different story. And I used to believe that until I started working on Countryfile. the weather gets in somewhere. It's not just me in Pembrokeshire. I'm not going to be able to make it to Pembrokeshire, I'm sorry! so unfortunately I'm going to have to sit this one out, Em. Would you do my stories for me, please? You know what, I will, I'll do this favour. You owe me one next time, all right? See next week! I'll set off now. Dramatic weather here is nothing new. What are your memories of stormy weather? So then we've just got one part of the church left?! and the rest of the church would have gone in that direction. -And you can see that in this picture. who were married in this church. You can also see that we've lost quite a lot of land since then. as they were getting washed away. and claimed more than 800 lives. Really, it is terribly stormy today, it's not just a bit stormy. I think this is the most clothes I've ever worn on Countryfile. Well, I have never seen it like this. Really? This is a super-bad storm? Yeah, look at... Look at this. To prove just how cold it is today, we've got icicles here. Seawater frozen on the bench! -This morning, we had a fairly high tide. and you can feel it through the pillow. what's it like being here in this village? ..that have sent spray twice as high as the church. and cascading down the back of the house. A sea wall was built to protect the village in 1889. But after every storm, it needs checking. if there's any problem, before it gets too big. And that's your responsibility, is it, to sort of look after it? -Or you take that on as your responsibility? -and so we wouldn't get any help with our sea walls. Managed retreat means giving in to whatever nature throws at you. and so the waves are left to shape this part of the coast. you've got to be quite practical? it's probably a bit more important than a lawnmower. in relation to the storms that come in, and protecting it? and everybody who's associated with this bay feels the same. and we'll do whatever we can to protect it and keep it. Your dog's decided to leave, I think he knows better than we do. We've got icicles out of seawater, shall we head indoors? -Oh, yes, I think perhaps it's time for a cup of tea. -Oh, it is, it is! but the traditional roast lamb could soon become a thing of the past. Tom's been finding out why. like waking up to the dawn chorus. and of course lambs gambolling in the fields. and it's not just the temperatures that have plummeted. The last three decades have seen a drop of nearly 40%. As a nation, we seem to have fallen out of love with lamb. and some think it's fatty and unhealthy. Put those together, and it's having a big impact on our farmers. -It's a bit raw today. -It is a bit raw. Are we going to tempt them up with a bit of food? I think we're going to have to go and find them. -OK, well, let's find out, shall we? His family have been farming sheep here since 1906. In the South Downs, there's hardly any sheep flocks left. because there's just no money in it when no-one buys it. So how has your flock changed, say, in the last 30, 40 years? and shorter, a big leg for that Sunday roast leg. and a slightly smaller leg that can be ready for the supermarkets. the balance between domestic and overseas? Exports would have doubled in our farming lifetime. where the UK just don't eat as much lamb. and send everything else abroad. It's a similar picture for many farmers like Will across the UK. keeping sheep farming afloat in the UK. they eat 20% of the lamb and mutton we produce. I'm running out of room on my plate but I like that! Can I go for a little salad, is that OK? -Yes, go for it, please. have invited me to dinner at their home in Hampshire. I mean, this is a fantastic lamb dish. how often would you eat lamb, say? So yeah, quite regularly, I suppose. would lamb quite often be served? -There would be a couple of dishes which would be lamb. So you would have it in every shape and form. and I suppose that's something that we've inherited from our parents. maybe in the way younger people view lamb? Not that I see it, from our generation. he'll be eating a lot of lamb in his diet? He looks pretty keen right now! I think he would, I think he would. you keep up with those traditions, as well, somewhat. in which a blessing is said before the animal dies. will have been slaughtered in the halal way. Why is that important? and now it's made halal. and it's been made permissible by God for you. conscious or not when killed. The vast majority in this country are stunned before death. Are you happy with it being stunned first? and then it's, you know, slaughtered. Which is fine, as well, it's not an issue. but one's labelled halal and one's just labelled normally. Well, I've made you do all the talking, and I've nearly finished. and that looks positive for our sheep farmers. is heavily reliant on exports to the EU. And you can't talk about exports without talking about Brexit. So what does the future hold for the British sheep industry? That's what I'll be finding out later. they've had to deal with in a long time. ..feeding and rescuing buried livestock from deep drifts. If they survived, that is. But in the Scottish Uplands, sheep face another challenge. Adam was there just before the storms hit. In this kind of terrain, sheep will often go missing. are looking into the mystery. Farming sheep can be fairly tricky at the best of times. it's inevitable that some will die for various reasons. up here they call it black loss. but Professor Davy McCracken hopes to finally solve the mystery. of lambs from these very extensive hill grazings. or they knew was out there in the first place. Just disappearing, yep, with no known cause. -as to know what is actually happening. of lambs do go missing, then? 450 ewes up in this flock, up in the high mountains. maybe even slightly higher, depends on the weather. -So, virtually a lamb apiece. -Yes, virtually a lamb apiece. And in a very bad year, we might end up with only sort of 250-300 lambs. -So, you're nearly losing half of them? -In a very bad year, yes. born up there, that know that that's their sort of territory. you have much fewer animals to actually choose from. of the number of lambs they should expect. the possible toll due to black loss later on. And what do you think is the problem? Oh... You could have lots and lots of theories. I think the landscape and the topography plays a part. I think predators play a part. I think it's a big combination of things. But it's something we need to get to the bottom of. And so, do you find the carcasses? because you can't account for it. In this vast, vast type of countryside, things vanish. It seems strange and hard to believe, but it happens. that wouldn't quite understand what it's like farming those hills. The hills up here, in my opinion, are hugely important. it's the whole rural infrastructure. does that make sheep farming unviable? by its absolute fingernails at the moment. and help to avoid it, I think that would make a difference. in this part of the world viable. These ewes have scanned out at about a lamb apiece. where they'll give birth over the next few months. could be lost to black loss. solving the black loss mystery is an uphill struggle. I can see why it's so difficult for a ewe to bring a lamb up out here. Well, indeed, Adam, and you're here on a good day! the shepherd is unlikely to come across it. you need to do a postmortem. there's so many scavengers up here, that the carcasses just disappear. And then if you CAN find it, can you sort out the problem? then you can't track back and work out why it might have died. but that doesn't happen up here? a lamb and who was keeping a lamb. So, you could really find out who the winners and losers are. That's our intent in the first instance. There's so many different factors to look at, isn't there? -You need to narrow it down. -Yeah, you need to start somewhere. And that's what we we're doing - who, what and when? And how much studying have you done so far? so we've got one year's worth of good data. what those common causes actually are. Well, let's hope you get to the bottom of it. We're certainly looking to do so anyway. the crew and I are still struggling with the weather. We're battling a little bit on Countryfile this week. giving us some rather unseasonal weather. but guess what, those stories both fell down. We've just heard tomorrow's story has also fallen down. just a few of the challenges we face. has fallen by nearly 40% in the last 28 years. Tom's been finding out what can be done to stop that decline. the last thing farmers need is more uncertainty. that is exactly what they're facing. and nearly all of that goes to the EU. is dependent on successful trade talks. it's at the forefront of Will Atkinson's mind. to find us new deals further afield. -cos we sell so much there. so we should be able to sell the meat to them. so people are going to end up going out of business. But how is the industry preparing for life outside the EU? Phil Hadley is from the Agriculture And Horticulture Development Board. It's his responsibility to oversee exports of lamb and mutton. to America or Canada or places like that? Some of those deals we made through the EU. Can we make deals on our own? so Saudi Arabia is an example of a bilateral deal. and in lots of cases we also have direct deals. we don't have additional, costly inspections. for the marketplace as a whole. but there could be new opportunities with other parts of the world. That is in the hands of the government. What the sheep industry needs to do is sell more at home in the UK. to fall back in love with lamb? Well, some say it has a bit of an image problem. where they make a right song and dance about it. And the UK lamb industry has a lot to shout about, too. then sheep are the obvious animal. you can't really intensively rear lamb. Someone who knows this only too well is Richard Taylor. to put lamb back on their plates. -Hi, Richard, how's it going? I'm certainly looking forward to it, but what are you actually preparing? for a couple of minutes each side. but how do you think that lamb is perceived generally by people? be finding their way into people's homes. that really work's for today's consumer? that's high in all the good fats, and low in the bad fats. that are part of a really healthy diet. so I think it, it really should be pushed. A meat for the 21st-century? I don't believe you, let me find out! Prove it to me! -Is there one I can go for, there? That is really good! That really does warm your toes. it is a busy time of year for our sheep farmers. in deciding the industry's future. and many of us to remember we once had a great appetite for lamb. The Pembrokeshire coast in early spring. and whipped by winds that bite. a Cuban painter and native of tropical Guantanamo. He first came here to Solva for a holiday 20 years ago. He loved what he saw, and made it his home. We walking up the hill. enormous horizon with an enormous amount of space on the sky. It wasn't just the landscape that captured Raul's heart. He was also smitten by its chaotic elements. I realised that the weather was absolutely mad. I see Pembrokeshire to my eyes and to my ear and to my skin. And then that's coming like a little performance in the canvas. it was called Pembrokeshire Weather Report. Yesterday, I was looking at the picture. I don't know what it is, but it's how I feel. because I've been open and honest. ..in people's imagination, because they always laugh. and the breeze and the temperature. That is Pembrokeshire for me. where Raul's palette was a riot of rich and vibrant colour. to capture the essence of Welsh weather. I couldn't even stand in here in this weather. that's been an amazing transformation. and then to be more subtle. but later, it will be sunny. And it does crazy stuff. Raul had never experienced the changing seasons. and I go, "Oh, my God, the trees, they are dying, they are dead!" And they go, "No, no, no, they are not dead. "They're coming from the winter." Even snow was a surprise. Pembrokeshire is not to see - Pembrokeshire is to feel. I've been looking at the effects of the storms on our rural communities. But ever resourceful, farmers adapt and innovate, whatever the weather. who have done just that. Damian and Meg McNamara were both raised on local dairy farms. using social media to promote their goats. -So, how did it get started, then, for you two? -I wanted a pet goat. Yes. It's her famous line, isn't it? -Yes. I was never allowed a goat growing up. Why not? When you grew up on a farm, it seems like an obvious thing. I know, it's my mother's farm and she never wanted me to have a goat. -So you went from two to how many? -About 230 at the moment. -that goat - I mean, what would she think? There you go! Exactly right - follow your dreams! -Right, so, these guys need feeding, do they? Damian and Meg breed Boer cross goats, a good meat breed. -what's the thinking behind that? really, so crops, flowers, trees. We've got... So, we've got Orange here, this is Wasabi. Betys, which is a Welsh plant name. -You can remember every single one? -I've spent a lot of time with them. -Meg has an amazing memory. -And how easy are they to look after? They're a lot more difficult than people would think. -Everybody thinks they will eat anything. -They don't. They're quite fussy. -This is your home-grown hay. This is our home-grown hay and our home-grown peas and barley. And this is what works for us at the moment. Yeah. Describe the field-to-fork process that you've got here. and all our boys are kept up to a year for the kid meat. And we sell direct, so it is very much farm to fork. That's great. Right, let's get this last bit in here. for any signs of goats that may need help. I think that might be someone kidding. and she suspects one of them's kidding. but a new mum calling to her kids. these newly born twins haven't got the energy to get up and suckle. So, what's the story with these twins, then, Meg? So, she's chosen the coldest day of the year to have these kids. -I've already milked her once to get the colostrum. they're just... They're very cold. -So, what we need to do is warm them up. and give it to the baby, better that she just gets it direct, really? -We'll try and stand her up now. -You've got to bribe her up with some food? Come on, then, girl, up you get. -Oh, look, it's good, isn't it? -See, she's got the idea now. Why is colostrum so important in newborns? it's like a shot of energy. -It's the best thing for them. We'll put this one back under the lamp. Because she'll probably nestle down with them now. -Bit of warmth with each other as well. But not all the kids are quite so lucky. and keeping a close eye on its weight. And just lift her up. Daily checks like this are vital to monitor the kid's progress. What would you expect for a three-day-old? -brought in, fed, kept warm. Hand-rears... Goodness, the challenges of this weather, though. where the welfare of their goats remains a top priority. -what life is like on the farm for the goats? cos they do want to know that they're buying high-welfare meat. So, we do try and post pictures every day, really, of the goats. -So, shall we take a photo now? Oh, hang on, we're in. and to help Meg and Damian grow the business. on the challenges of running the farm through all weathers. And it also allows them to share good news. has been adopted by a new mum. Well, that's all we've got time for from a very blustery Pembrokeshire. Let's hope it's a touch calmer next week, when we'll be in Shropshire. with a nose for the perfect pine marten poo. Make sure you've eaten your tea by then! I've got to get out of this weather! Ellie Harrison is in Pembrokeshire looking at the effect of recent storms on the coastline. Adam Henson is in Scotland exploring the mystery behind some missing upland sheep. Tom Heap looks at the problems faced by the UK's sheep farmers and asks why people have fallen out of love with lamb.